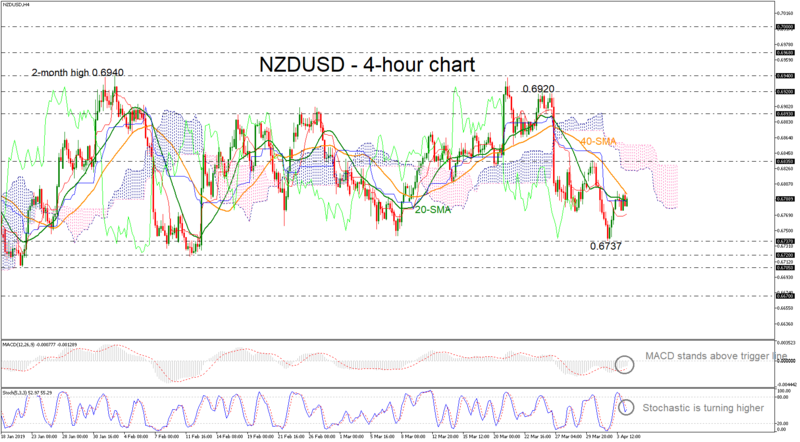 NZDUSD found strong obstacle at the short-term simple moving averages, driving the price beneath them. However, the pair is gaining some momentum, with the Stochastics returning to the upside and the MACD heading above the trigger line but still below the zero line, though less aggressively than in previous days, giving some signs of weakness. In case prices advance beyond the SMAs, the way could open towards the 0.6835 resistance, taken from the latest highs, and into the Ichimoku cloud. Slightly higher, the upper band of the cloud around 0.6855 could come in focus, which if it fails to hold, further gains could follow, probably until 0.6993, identified by the inside swing bottom on March 26. On the downside and under the red Tenkan-sen line, the bearish action could pause first near 0.6737, where the price has failed to stop below it since February 12. If the line appears easy to break, the 0.6720 and the 0.6705 could be next barriers to look for. Meanwhile in the medium-term picture, NZDUSD is trading within the 0.6940 – 0.6737 range. Chances for a bull market seem to be improving as the 50-day MA keeps increasing distance above the 200-day MA, but slowly so.